Added by Marc Russinoff on February 6, 2019. 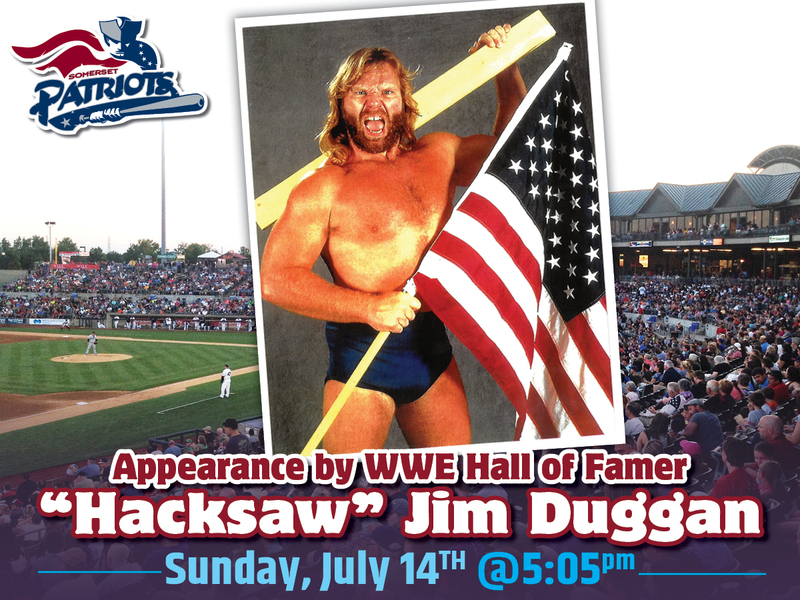 Bridgewater, NJ- The Somerset Patriots have announced that the team will welcome WWE Hall of Famer “Hacksaw” Jim Duggan to TD Bank Ballpark for an appearance on Sunday, July 14th. Game time against the New Britain Bees is scheduled for 5:05 pm. He will then sign autographs for fans on the main concourse for two hours from approximately 5:00 pm to 7:00 pm. He will be signing one item per person at that time. 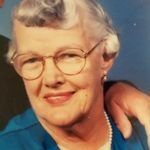 Beginning his long wrestling career in the late 1970’s, Duggan rose to fame by winning the first-ever Royal Rumble match in 1988. He entered the contest at the 13th position and battled his way to be the last man of 30 standing. He later defeated Haku in 1989 to earn the right to call himself the “King of Wrestling,” proudly wearing a crown as part of his victory. Duggan joined World Championship Wrestling (WCW) in 1994 and ultimately earned his way to becoming the United States Heavyweight Champion and World Television Champion. He made his long-anticipated return to the WWE in 2005 and was inducted in the WWE Hall of Fame with the class of 2011. 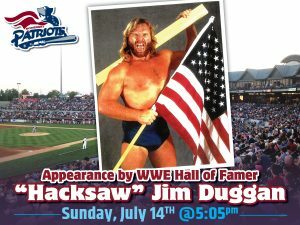 For tickets to the July 14th game featuring “Hacksaw” Jim Duggan, visit www.somersetpatriots.com.